I've been spending lots of time lately thinking about what the baby needs, looking up patterns, sorting yarn in my stash, and knitting for her whenever I can. But then my very luxurious, very fancy cashmere yarn from Grace's shop (purchased with my Christmas money!) came in the mail, and I decided to make a little something for myself with it. And before I knew it, I spent every spare moment these past two days knitting away with this oh-so-soft and beautiful yarn. Drastic measures were occasionally employed. Baby needs rocking? Put her in the sling, jaunting around in circles while knitting. Meals need to be prepared? Grab something (anything!) from the freezer stash and knit while it heats up in the oven. Neighbor calling about your chickens escaping again? Ask husband to go round them up while watching from the porch, knitting. Baby needs nursing? Nurse her lying on side in bed, while holding arms up knitting until they feel numb. Time for bed? Convince yourself that sleep is overrated and knit those last few rows with the lights as dim as squinted eyes can see by. 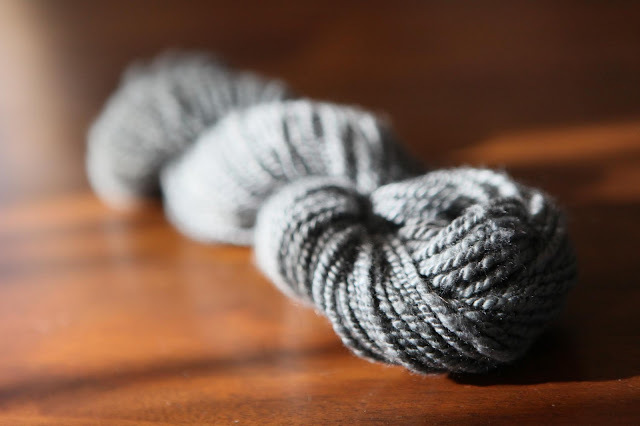 That's how completely smitten I was with this yarn and this project. Want to know something else? This is actually the very first thing I've knitted for myself. I think I'll wear this little cowl during the farm chores every day until spring comes. Yes, I think I'll do just that, all the while feeling very fancy and luxurious indeed! I am so thrilled that you love the yarn and appreciate the goat that it came from. The drive you felt to knit is the drive I have in caring for my animals and spinning their fiber. 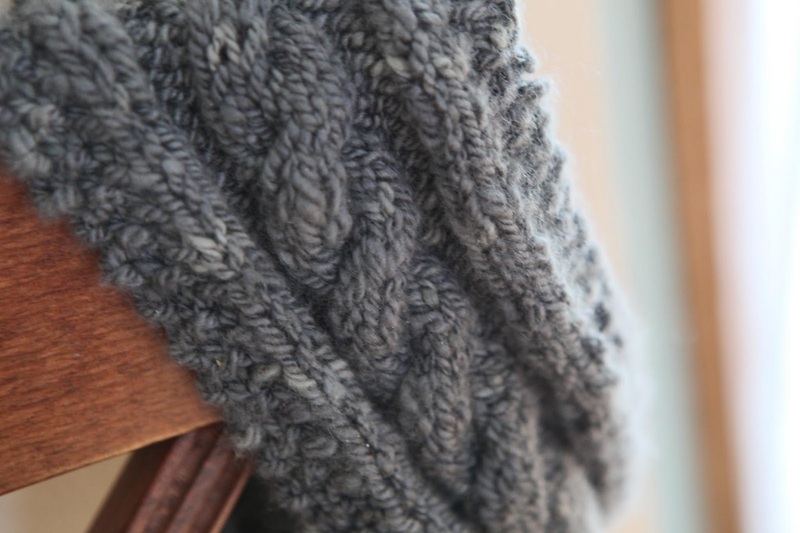 I hope you can feel the love that I put into my yarn and the cowl you created is breath taking. Think of it as Larkspur Funny Farm giving you a hug every day. Many thanks for your support of my farm and those who live here. Gorgeous! I love love love it! So worth all the things that went undone, or half done, or sort of done... And lovely photo of the smile at the end of all that concentrated knitting. Brava, Mama! Absolutely stunning! :) I can only imagine how lovely that yarn feels - it LOOKS so incredibly soft and cosy. 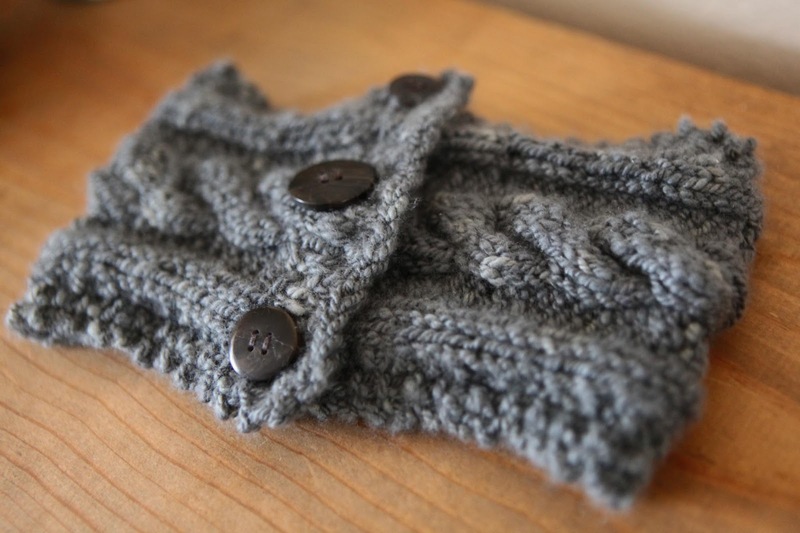 I MUST learn to knit well - MUST, MUST, MUST!!! just wonderful.the yarn and the pattern absolutley a dream.i love it!! Wow, that is beautiful. The yarn looks lovely, and the pattern is beautiful. So nice to finally knit something for yourself. I know the feeling, I finally knit something for myself over the holidays too. I think I'm going to have to break down and order some of her lovely, lovely yarn for myself. How pretty! Isn't it wonderful to be so excited about working on a project? Oh that's beautiful. I can almost feel its gorgeous texture. And I love the colour too. If it wasn't so blooming hot over here, I might have been tempted to pick up a pair of needles myself! In all my years of knitting I have neer made myself anything...must work on that this year. 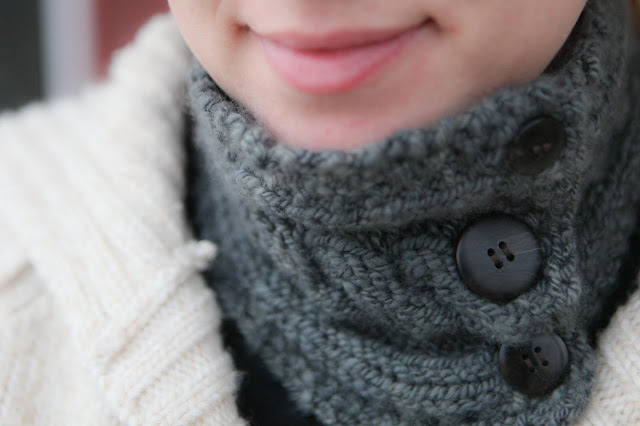 That cowl is gorgeous and just perfect for warding off the chill. The cowl looks very nice and cosy. 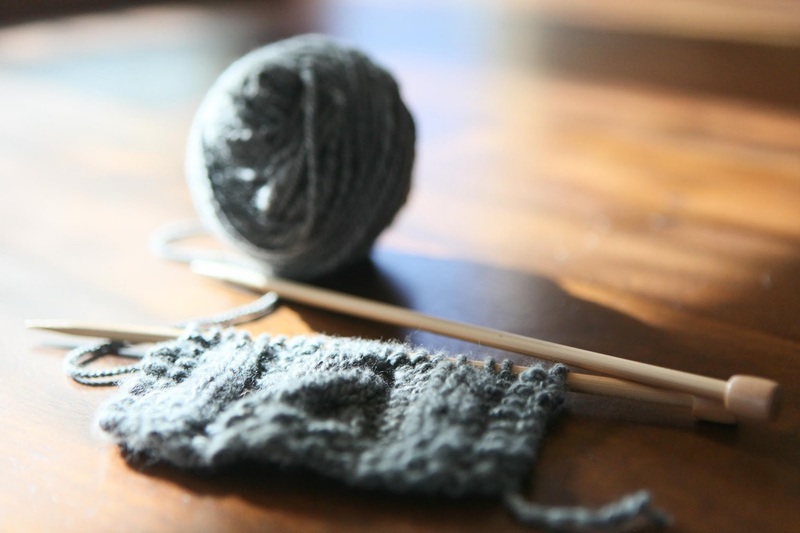 How good it is to knit something for ourselves, have you knitted some real wool socks for you? Absolute bliss. How clever you are and i am so impressed that you were able to spend the time and effort on yourself...we should all do that more often...it looks so cozy and soft and i bet you feel like a million dollars wearing it and knowing you made it yourself! Beautiful! I've knitted in all of the situations listed. It really is almost a sickness, isn't it? If I could get away with knitting while teaching, I would. Love the colour, the buttons, and your sweet smile of satisfaction! No one appreciates a fine piece of knitting like chickens (just tell yourself that! )...well done! Awesome! It looks beautiful. I am a big proponent of the idea that if you keep your neck warm you stay loads warmer. Most people say the head (which is not to be ignored), but I think it is the neck. Beth, I think you're on to something there! I definitely felt very warm wearing it yesterday, and noticed a rush of cool air when I took it off.